This is a little deep, and only vaguely related to advertising, but you’ve been good and can handle it. Here goes. Does communications have to have a point? Think back, way back, to being a child, no, a toddler, maybe 18 months, just before language and words structured your thoughts and you just toddled outside to see the blue sky and green grass and smelled the world in all your toddle-toddlehood. We all learned to intake information not with logic or words … but sound, images, colors, aromas, sparks, feelings. That’s easy to forget in traffic or meetings or The New York Times. Watch a few seconds of this clip and try to remember. Just remember. Then go back to your Excel and Twitter, suffer words and numbers, and sling those arrows into PowerPoint. Ah, we can never go back. If you’re in love with someone beautiful, you’re probably delusional. Your sweetie is ugly, and you may be, too. We know this is a harsh finding, but data bear it out. Researchers dug in to the web site Hot or Not, the silly “judge a photo” site that has grown into a dating service, and found a treasure trove of human mating behavior. Key findings: Almost all users of the service rated people the same on a “hotness” scale of 1 to 10 (proving we all recognize beauty or the beast when asked to judge a picture); yet users who were themselves rated lower on the scale were more likely to want to date others lower in the beauty rankings. 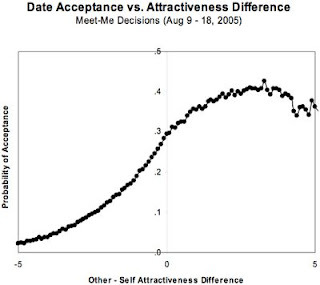 In fact, for every 1 point on the 1-10 scale a user dropped in attractiveness, he or she was 25% more likely to accept a date. Hmm. Ponder the horrible truth. We all really recognize beautiful people. But if we are more, um, normal in appearance, we’re more likely to want to date others at that level. The scientists conclude that matchmaking is hardwired into our genes. Moderately attractive people go after other moderately attractive people, since the odds of rejection are lower — and thus finding a mate more likely. As like attracts like, the genes get passed on, ensuring human survival even though we don’t all look like Angelina Jolie or Brad Pitt. For marketers and creatives, this may mean it’s time to re-evaluate the use of extremely beautiful models in advertising, since too much of a hot thing could turn the mediocre masses off. This just in: Economists at Elon U. report that there is an actual beauty premium in life — men and women who are considered really good-looking earn 4-5% more than average Joes and Janes, while homely folks are penalized with an income 10% less. And it seems better grooming can boost your personal results in life. showing wages are a direct function of human capital characteristics (X1), occupation and industry controls (X2), and beauty (B). Yes! 1. Our evaluation of peers must be based on evolutionary inclinations to be near athletic, healthy people less likely to carry disease and more likely to bear offspring. 2. Given this genetic bias, advertising creative showing healthy, beautiful people is more likely to pull response, all other factors considered. 3. Dang, you there, you’re looking fine. Give us a call.